I probably should be showing you a Fall card today because of the glorious Fall weekend we had here, but this was next up in line so I'm just gonna go with it. I will be posting pictures AND a recipe from our annual Apple Pickin', Apple Donut Eatin' trip on Saturday either tonight or tomorrow. We had an awesome time - as always - and the pies and cake we made Saturday evening turned out fabulous!! I'll be sharing the Apple Cake recipe because it's SO yummy and SO easy. 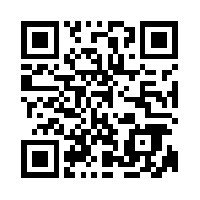 Be sure to check back, ok? I called it Christmas Serendipity because it includes three pieces from my serendipity pile on my counter top in the studio. That's my pile of little pieces of stamped, punched or die cut pieces that I just KNOW I can do something with, so they are saved from the circular file. 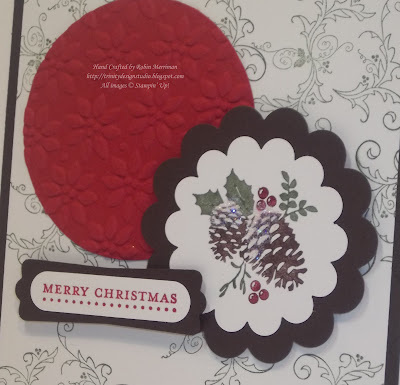 Here, I had the Early Espresso 4 1/4" square layer and the Very Vanilla 4" Square layer along with the Riding Hood Red texturized 2 1/2" circle piece in my pile, and I just knew they could come together in a new card. The background is stamped in Always Artichoke with the swirl from the Pines and Poinsettias stamp set. I added those two layers to a folded 5 1/4" square Very Vanilla card base. I really like the wider border on this one. The focal images were easy to choose, I simply punched out a 2 3/8" Scallop Circle from Early Espresso and layered it on top of the Riding Hood Red circle that had been run through the Big Shot with the Petals-A-Plenty Embossing Folder. The main stamped image from Pines and Poinsettias as well, was markered with Always Artichoke, Early Espresso and Riding Hood Red. I stamped it on a scrap of Very Vanilla and punched it out with the 1 3/4" Scallop Circle punch. 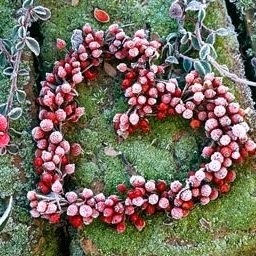 The pinecones were dusted with Dazzling Diamonds glitter using my 2 Way Glue Pen. Those layers were popped up on Stampin' Dimensionals. The greeting, from Teeny Tiny Wishes, was stamped in Riding Hood Red on Very Vanilla then punched out with the Word Window Punch. I layered it on a punch out of Early Espresso done with the Modern Label Punch. 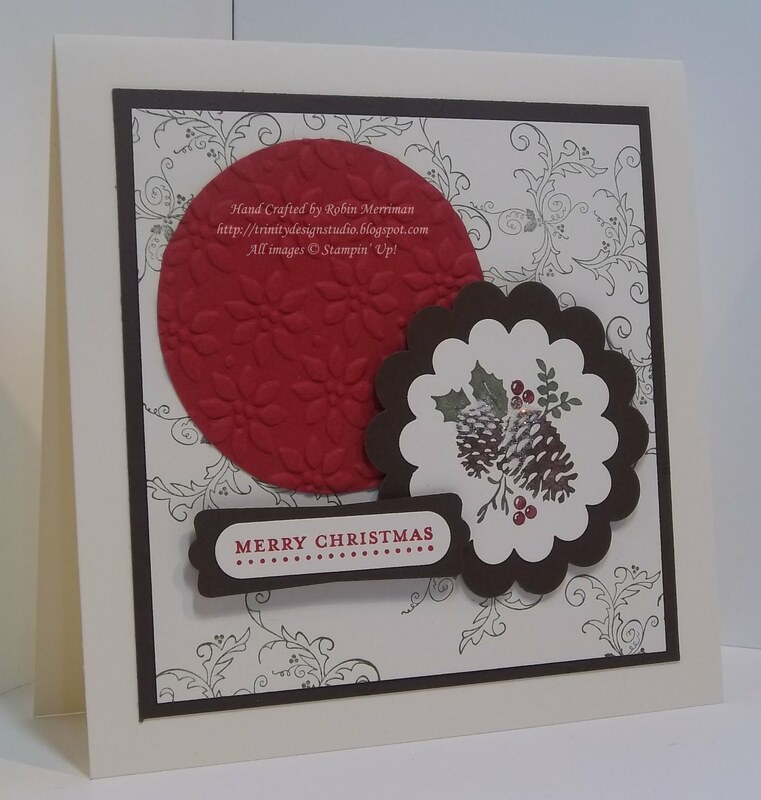 It's popped up on more Stampin' Dimensionals and completed this quick and easy card. The most surprising thing for me on this card? I didn't use any ribbon. I know - crazy huh? But it didn't need any more embellishment so I left it alone!! Well, I'm off to a busy, busy day in the studio. I have lots of prep work to do for my classes and team meeting later this week and the last thing I need is to get behind again! 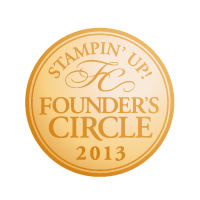 As always, you can purchase your Stampin' Up! 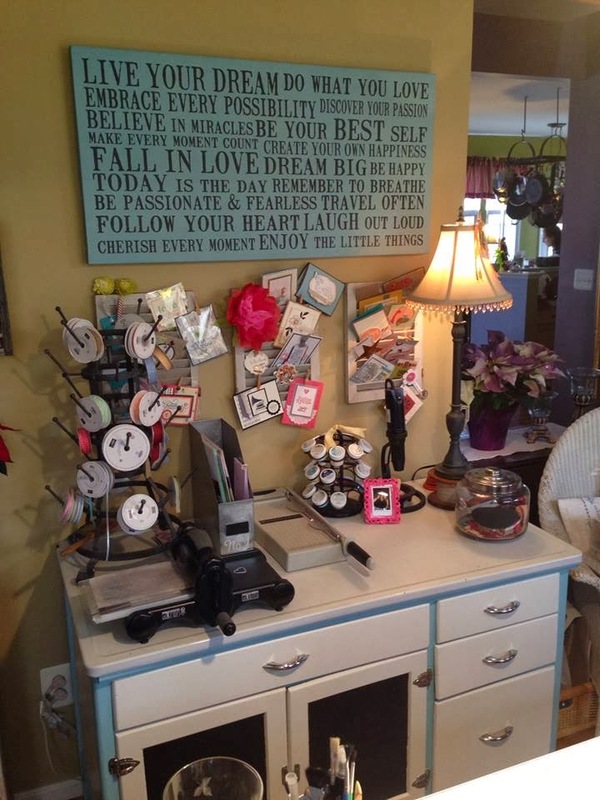 supplies from my Online Stampin' Store. 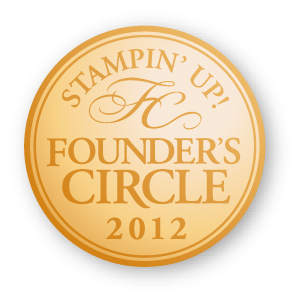 I use Stampin' Up! only on all my projects, so you don't have to visit any other store but mine to recreate my projects. Makes life a lot easier, doesn't it?